Co-chairs: Ernazarov N.Sh., Guoliang Wu, Muminov A.R., Cassara M.
42 participants took part in the round table and 8 reports were presented and addressed the issues related to financial and economic mechanisms of water management and use in the Central Asian countries, financing of adaptation to climate change in transboundary basins, improvement of irrigation water productivity in river basins through water-saving technologies, gender aspects of access to clean drinking water, etc. Mr. Ye.Badashev, representative of Executive Direction of IFAS in Kazakhstan and Mr. Ya. Paschiyev, Head of Department at the Ministry of Agriculture and Water Resources of Turkmenistan in their reports presented specific features of financial and economic mechanisms of water management and use in Kazakhstan and Turkmenistan, respectively. 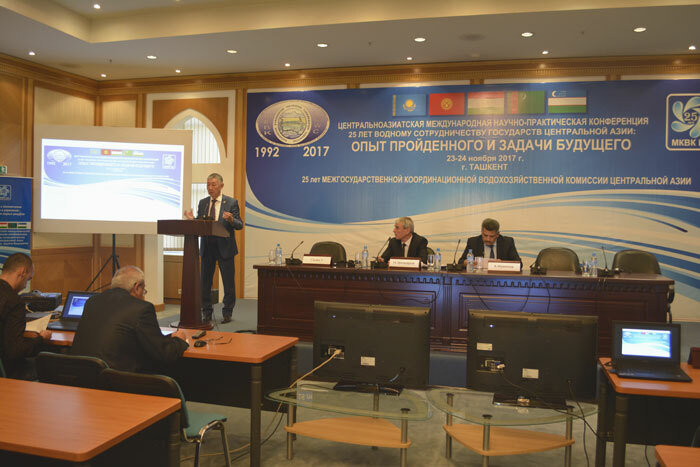 The report by Mr. A.Muminov, Head of Department at the University of World Economy and Diplomacy addressed international legal aspects of transboundary water sharing. Mr. N.Ernazarov, Head of State Inspection УUzvodnadzorФ, in his report showed specific context and underlined a need for investments in order to ensure safety of hydrotechnical facilities. Mrs. M. Tignino, Reader of the Faculty of Law at the University of Geneva and Coordinator of the Platform for International Water Law/Geneva Water Hub, presented her vision of financial mechanisms for joint water infrastructures. Mr. B. Hajiyev, UNECE Economic Affairs Officer, is his presentation addressed financing of adaptation to climate change in transboundary basins. Mr. S.Mamatov, Director of Information-Analytical and Resource Center of MAWR in Uzbekistan, reported on possibilities to improve irrigation water productivity through water saving technologies. The report of Mrs. K.Musabayeva, National Water Partnership of the Kyrgyz Republic, covered gender aspects of access to clean drinking water. Existing financial and economic mechanisms of water management and use need to be improved to attract private investors. More active mobilization of investments from international financing institutions is needed to ensure reliable operation and safety of hydrotechnical facilities. Wider application of water saving technologies would allow improving irrigation water productivity.